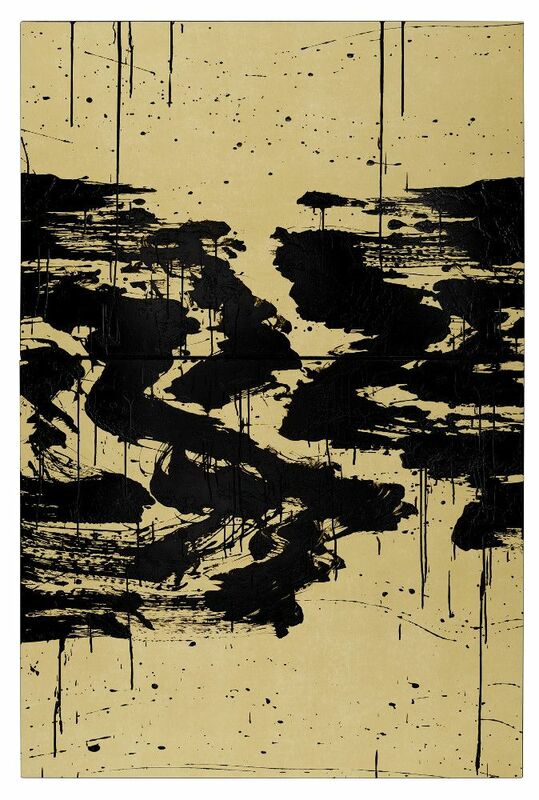 Waddington Custot is proud to present Fabienne Verdier’s first solo show in London, featuring recent large-scale abstract paintings. This November, Waddington Custot is proud to present Fabienne Verdier’s (b. 1962, Paris) first solo exhibition in London. The exhibition will feature large-scale abstract paintings produced over the last year. These include recent work from the Walking Paintings series as well as a new group of paintings, Rhythms and Reflections, which mark a noteworthy change of direction for the artist. As a painter known for combining an Eastern artistic education with the tradition of Western art, Verdier’s work is characterised by bold gestural compositions relying on a number of techniques developed over the past thirty years. In an intensely physical process, Verdier uses painting tools of her own invention, largescale, custom-made brushes, funnels and other implements suspended from her studio ceiling. This vertical painting technique allows Verdier’s mark making to be a product of the body moving freely, not restricted by the weight of the brush, playing with gravity. The paintings combine the influence of Action painting with more meditative, theoretical concepts of unity, spontaneity, asceticism and other aspects of an Eastern trajectory of art history.